The Battle of Alegaon was fought between Nizam Ali Khan of Hyderabad and Raghunathrao of the Maratha Empire against Madhavrao I of the Maratha Empire. Raghunathrao had established an alliance with Nizam Ali Khan of Hyderabad. When conflict arose between Raghunathrao and Madhavrao I, a joint campaign between Nizam Ali Khan and Raghunathrao resulted in Madhavrao I being heavily defeated. 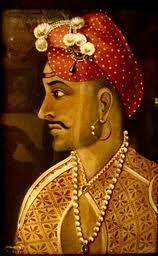 Madhavrao I surrendered on November 12, 1762. Nizam Ali Khan got all of his previously lost territories that were lost at the Battle of Udgir. Madhavrao I submitted to his uncle, Raghunathrao. The Battle of Satara was fought between the Mughal Empire and Maratha Empire between 1699–1700. Mughal Emperor, Aurangzeb ordered for an attack on the fort of Satara. The Mughals destroyed major parts of the fortress and Maratha commander Subhanji surrendered on April 21, 1700. The First Battle of Katwa occurred between Bengal and Maratha Empire in 1742. The Marathas initially attacked and captured Katwa and Hooghly in Bengal. The Nawab of Bengal Alivardi Khan responded with a direct attack on the Maratha camp at Katwa and inflicted so heavy losses on them that the entire Maratha army was driven out of Bengal on 17 September 1742. Janki Bhosale (née Gujar) (1675 - 2 March 1700 CE) was Empress consort of the Maratha Empire as the first wife of Rajaram Chhatrapati. Jankibai was the daughter of Prataprao Gujar, an aristocratic general, who was the commander-in-chief of the Maratha Empire. Her father died in a battle against the Mughals at Nesari on 24 February 1674. Shivaji, the king of the Marathas upon hearing the solemn news, grieved his general's death. As a result, he married his second son, the ten-year-old Rajaram to the five-year-old Jankibai. They got married in a grand ceremony that took place in Raigad Fort on 7 March 1680. Her father-in-law Shivaji died on 3 April 1680, twenty five days after her marriage. Jijabai Shahaji Bhosale (12 January 1598 – 17 June 1674), referred to as Rajmata Jijabai, was the mother of Shivaji, founder of Maratha Empire. She was a daughter of Lakhuji Jadhavrao of Sindhkhed. Madhav Rao I (February 14, 1745 – November 18, 1772) was the fourth Peshwa of the Maratha Empire. During his tenure, the Maratha empire recovered from the losses they suffered during the Third Battle of Panipat, a phenomenon known as Maratha Resurrection. He is considered one of the greatest Peshwas in Maratha history. The Maratha emperors, belonging to the Bhonsale dynasty, from the early 17th century to the early 18th century, built and ruled the Maratha Empire on the Indian subcontinent, mainly corresponding to the modern countries of Bangladesh, India and Pakistan. Their power rapidly dwindled during the 19th century and the last of the emperors was deposed in 1818, with the establishment of the British Raj. At their empire's greatest extent in the late 17th and early 18th centuries, they controlled much of the Indian subcontinent, extending from Bengal in the east to Atak and Sindh in the west, Kashmir in the north to the Kaveri basin in the south. Peshwas served as subordinates to the Chhatrapati (the Maratha king), but later, they became the leaders of the Marathas, and the Chatrapati was reduced to a nominal ruler. During the last years of the Maratha Empire, Peshwa were instrumental in expanding the Maratha Empire to this extent. Moropant Tryambak Pinglay (1620–1683), also known as Moropant Peshwā, was the peshwa of the Maratha Empire, serving on Chatrapati ShivajiMaharaja's Ashta Pradhan Council of Eight (English-Ashtapradhan Mandal, Marathi-अष्टप्रधान मंडळ). A Peshwa was the equivalent of a modern Prime Minister in the Maratha Empire of the Indian subcontinent. Originally, the Peshwas served as subordinates to the Chhatrapati (the Maratha king), but later, they became the de facto leaders of the Marathas, and the Chatrapati was reduced to a nominal ruler. During the last years of the Maratha Empire, the Peshwas themselves were reduced to titular leaders, and remained under the authority of the Maratha nobles and the British East India Company. All the Peshwas during the rule of Chhatrapati Shivaji and Sambhaji belonged to Deshastha Brahmin community The first Peshwa was Moropant Pingle, who was appointed as the head of the Ashta Pradhan (council of eight ministers) by Chhatrapati Shivaji, the founder of the Maratha Empire. The initial Peshwas were all ministers who served as the chief executives to the king. The later Peshwas held the highest administrative office and also controlled the Maratha confederacy. Under the Chitpavan Brahmin Bhat family, the Peshwas became the de facto hereditary administrators of the Confederacy. The Peshwa's office was most powerful under Baji Rao I (r. 1720-1740). Under Peshwa administration and with the support of several key generals and diplomats, the Maratha Empire reached its zenith, ruling major areas of India. However, after the Peshwa Raghunathrao allied himself with the British, the Peshwa's power declined substantially. The subsequent Peshwas were titular leaders and are said to be responsible for the downfall of the Maratha empire, due to inefficiency in handling the affairs of the state. Later on many provinces were controlled and administered either by the Maratha nobles such as Daulat Rao Sindhia or by the East India Company. During this period, the Maratha confederacy came to its end through its formal annexation into the British Empire in 1818. Putalabai Bhosale was the third queen of Shivaji Maharaj. She was married to Shivaji Maharaj in the year 1653 and was from Palkar Family. Putalabai was the youngest of the surviving wives of Raja Shivaji. Being childless she went sati in funeral pyre of Shivaji Maharaj. Rajaram II Bhonsle, also known as Ramaraja, was the 6th monarch of Maratha Empire. He was an adopted son of Chhattrapati Shahu. Tarabai had presented him to Shahu as her own grandson and used him to grab power after Shahu's death. However, after being sidelined, she stated that Rajaram II was only an impostor. Nevertheless, Peshwa Balaji Baji Rao retained him as the titular Chhatrapati. In reality, Peshwa and other chiefs had all the executive power, while Rajaram II was only a figurehead. Sakvarbai was a wife of Shivaji Maharaj, the founder of the Maratha empire in India. Sakvarbai Gaikwad got married to Shivaji in January 1656 and later gave birth to a daughter. After Shivaji's death in 1680, Sakvarbai had wanted to commit sati just like her husband's third wife Putalabai, who was childless. But she was not allowed to do so because she had a daughter. Shivneri Fort is a 17th-century military fortification located near Junnar in Pune district in Maharashtra, India. It is the birthplace of Chhatrapati Shivaji Maharaj, the founder of Maratha Empire. 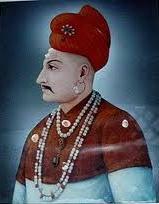 Shriniwasrao Parshuram (1687 – 1746 CE), popularly known as Shripatrao Pratinidhi or Shripatrao Pant Pratinidhi , was a General of the Maratha Empire. He served as Pratinidhi (Chief Delegate) during Chhatrapati Shahu I reign. After the death of his father Parshuram Pant Pratinidhi in 1718, Shripat Rao won the favour of Shahu by his brilliant efforts as a soldier fighting many battles in the defence of the Maratha Empire. In 1718, he was appointed as the Pant Pratinidhi of Maratha Empire.Shripatrao was not only a very able administrator and organizer, but a great statesman too. His work to consolidate the Maratha Raj has been praised by most of its historians. Shahu Maharaj depended upon the advice of Shripatrao.If owing to some unavoidable reasons Rao didn't present at the court at the usual hour the king would go to his house and inquire about him.Thus Shripatrao, unlike his father had no problem of loyalty to Chatrapathi Shripatrao was asked by peshwas to establish his headquarters at Poona. Rao consistently refused to do so. He wanted to be at the side of King of the Maratha Empire, and away from the intrigues pomp, pride, and debauchery of the Peshwa court.